The Barbour Ruskin Dress new to A/W 2015 Morris collection crafted in a beautiful blend of polyester and viscose, with an open scoop neckline and long sleeves perfect for an autumn / winter outing. 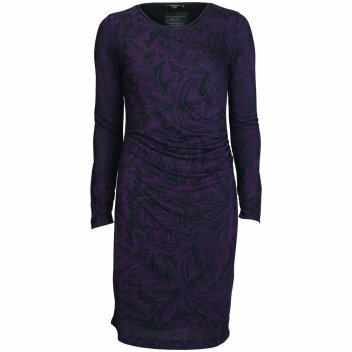 The smart and sophisticated garment with a refined Morris print and ruched gathers to the one side provides an extremely flattering feature. Barbour has added subtle yet beautiful features to the cuffs which are elegantly gathered with a satin pipping around the neckline. A must have for this A/W.